Last weekend, I tapped into my woo-woo side and held my first ever full moon party. I've done full moon and new moon rituals on my own before, and I've loved how they feel like a special occasion, smack in the middle of an ordinary month. If you treat them as such, they can feel like their own mini-holidays. First order of business was to set our crystals out to charge in the full moon light. I personally don't believe that crystals need charging, but I also feel they're happiest connected to nature. 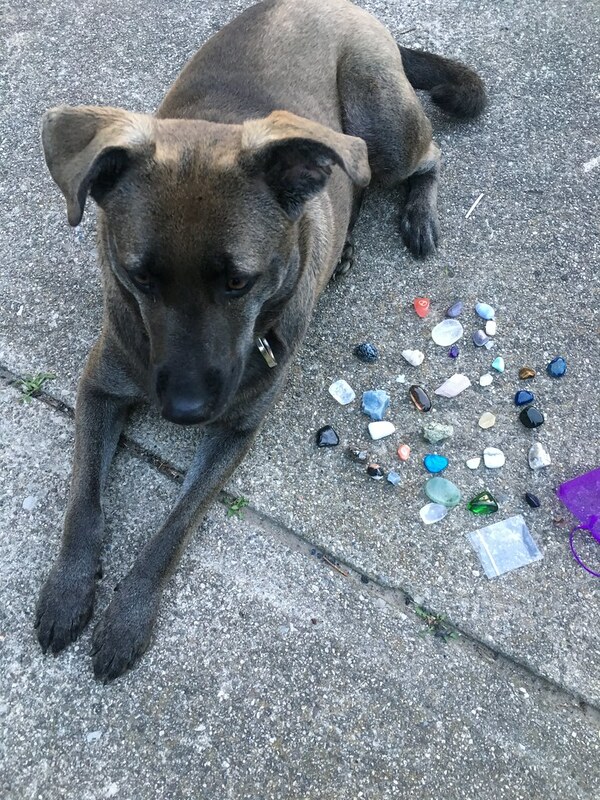 Galli kept watch over my sister's crystals...too funny. She laid down right next to them - animals know where the good energy is! We waited a while for the moon to come up in the sky, and then I put on some alpha wave music (this video is my favorite - I often put it on while doing a little self care) and we journaled about all the things we wanted to let go of, heal, or improve. There's no rules for this - you can make a list, write out sentences, or even write a letter directly to the moon. Next, we lit some sage and folded up our letters/lists into whatever shape we wanted. I made a paper crane out of mine - my mom folded hers into a heart. We saged the letters, and then dropped them into the fire to officially set their contents free from our lives. With our negativity burning away, I smudged everyone with sage and then palo santo. I also tried to get a few pictures of the moon, but I just don't have the lenses for it and my phone barely even tries, lol. It was SO bright and beautiful and it cast long streaks of moonlight on the grass. It started getting really dark at this point and there were stars dotting the sky all around us. I put on our guided meditation (we used this one) to now guide our bodies through what our minds just did through our journaling. Everyone at the party is a yogi, so falling into meditation is pretty easy for us - it felt so refreshing to relax into this one while being outside under the moonlight. It was SO cleansing! Finally, we did a super quick jotting down of the things we've now made space for in our lives. When we declutter on the full moon, we make room for the new moon to bring us our heart's desires. 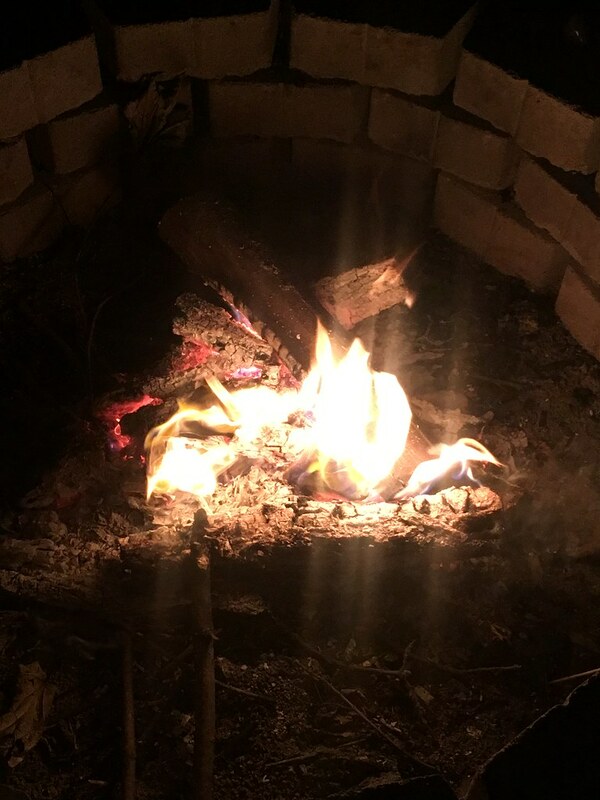 So while focusing on what we'd now manifest wasn't the goal of last night, putting our initial thoughts on paper while we were feeling the most refreshed was just meant to guide us through the next two weeks as we waited for the energy of the new moon. This was a super fun and relaxing gathering, and I'm so glad we did it! Do you celebrate the full moon? Did you do anything special for this Full/Blood/Buck Moon with a Lunar Eclipse?? I would love to have a full Moon party, the bad thing is mosquitos. 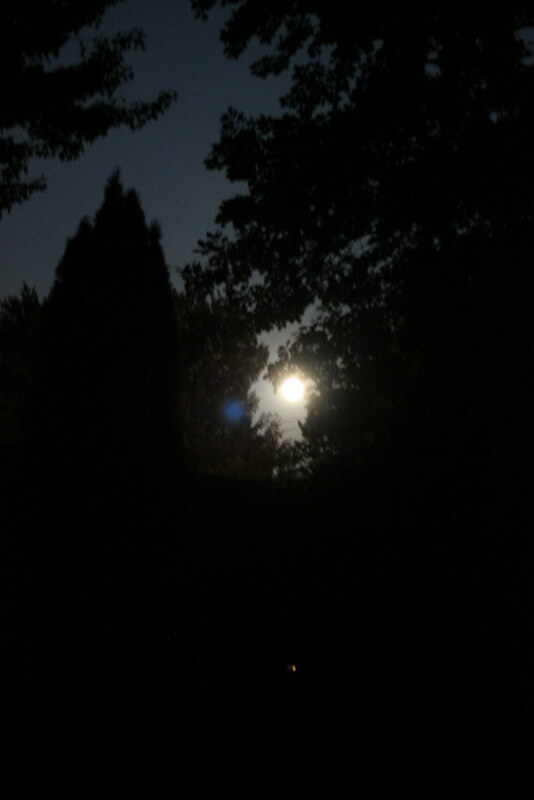 I always want to go outside at night during a full moon, but don't want to get eaten alive. haha. I love to charge my crystals during a full moon & new moon, but for some reason it seems to always rain. 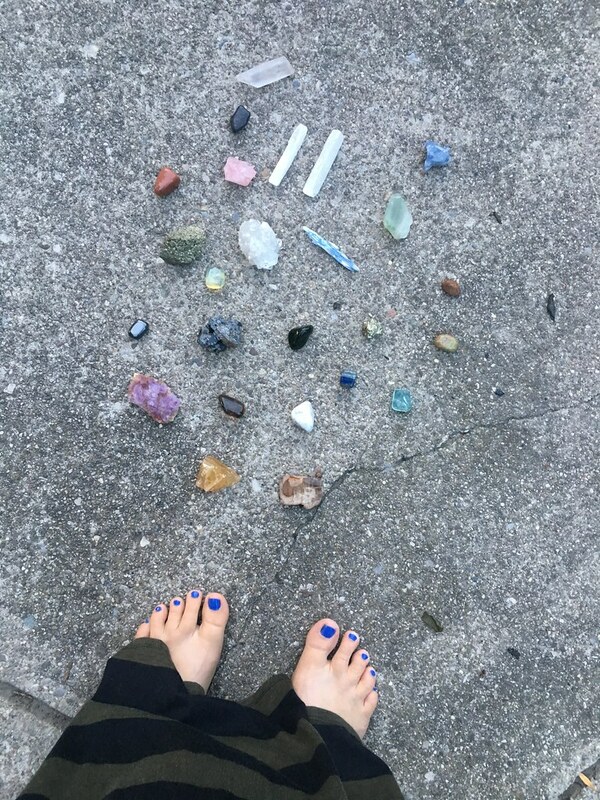 It rained during this last Full moon, so I put my crystals outside in tupperware on my deck. We don't have windowsills in our house. I did dust my alter & used my sage spray & sprayed it. So I feel like I accomplished something. I love that you journaled. 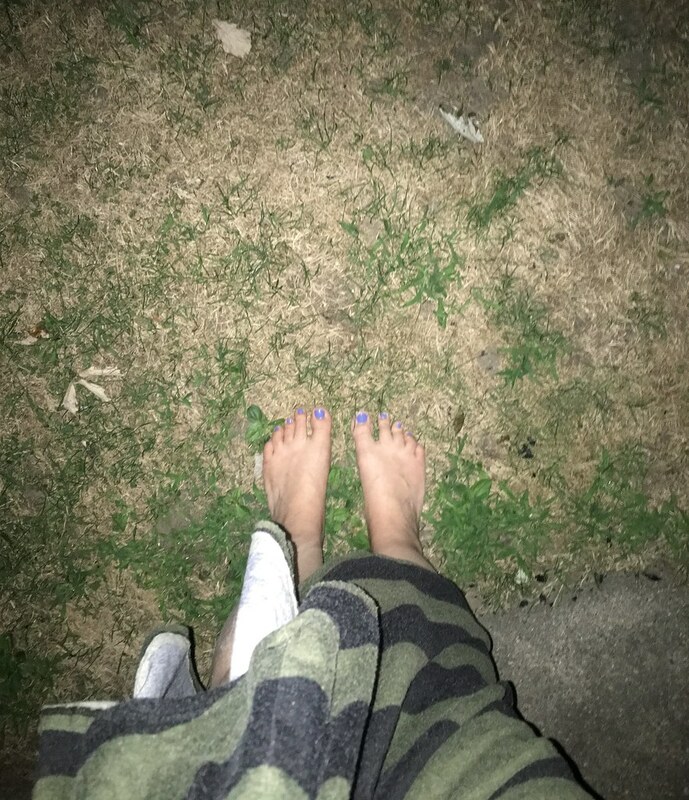 I also love standing in the grass barefoot. I do that when I water my garden. You know what, I'm usually in the exact same boat with the mosquitoes! We have a pond behind our house so they get particularly bad here. However, because of the drought, they have been really tame this year! We did get dive-bombed from some bats at the end of our meditation though! lol And yeah, even if it's not exactly how you planned, I think playing with the energy of the full moon in any way is helpful!! !